Microsoft rebrands Hotmail, but will you like it? Is Outlook.com really the answer to Microsoft's problems? Hotmail has never had a great reputation. In the early naughties it was the de facto webmail, but when Gmail launched in 2004, it struggled to keep up with the needs of savvier users. Plugging it into Windows Live hasn't helped; the suite of web services is now a broken beast and Microsoft knows it; the whole of Windows Live will be reworked as we go into Windows 8 season. We're betting you probably use Gmail, but it's really rather important to note that Hotmail still has a whacking 350 million users - and Hotmail is an extremely important product for Microsoft. So now it has rebranded Windows Live Hotmail as Outlook.com. Microsoft has pulled off some branding surprises recently; Office 365 will be available for consumers as well as businesses in the Office 2013 world, while Outlook - traditionally a business brand - has also now supplanted Hotmail. The renaming seems a little strange when Mail in Windows 8 is called just plain old 'Mail' yet has a similar design, while you'll now have Outlook on your work desktop and in your browser. And that's before you get to the design; it's hard to distinguish between Outlook.com and Outlook 2013 - they look extremely similar even if the functionality is different. Outlook.com relies very much on the tried and tested columns design of full-fat Outlook and, indeed, the Windows Live version of Hotmail. If you've used Windows 8, it's like the Mail app, but better. If the Mail app in the final version of Windows 8 works as well as Outlook.com, it will actually be useful. Microsoft wants you to plug everything into Outlook.com; it seems like it's a key component of Microsoft's Windows 8-era online offering alongside SkyDrive. However, this is just a preview version of Outlook.com, so it isn't finished as yet, and a few things we tried to do were broken. For example, the promised Skype integration doesn't work yet, and while you will be able to plug in social networks as time goes on, at the moment this uses the same mechanism as Windows Live social accounts currently, and clicks through to old-school Windows Live. The calendar does the same. You can open and edit Word, Excel and PowerPoint files in your inbox, which will change how people deal with their inbox. It's a shame it doesn't have the in-place replies from Outlook 2013 though. Messenger is also integrated, too, and works extremely similarly (though better) to the Messaging app in Windows 8. It's difficult sifting through the Microsoft bluster when looking at what Outlook.com brings to the party that's new. After all, Outlook.com is basically what Hotmail was and so features such as inbox tidier Sweep are presented as new while they're are actually old. Microsoft clearly believes it can attract users from Gmail, and the site gives instructions on how to port email from Google as well as how to set up Outlook on various devices including the iPad. You can also choose an Outlook.com email address that will work in addition to your existing Hotmail one. However, be warned, this will cause havoc if you have set up a Windows Phone with your existing Windows Live or Microsoft Account. 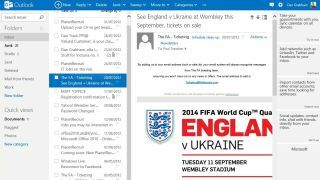 We think Outlook.com works well as a device to appease Outlook-savvy Hotmail users. But for many, it will seem like Microsoft is merely trying to impose the Windows 8/Office 2013 design language on the masses. And it's won't make people switch from Gmail. But Outlook.com is a definite improvement on Hotmail - though we're baffled why Microsoft has chosen Outlook for the name of a totally consumer product. All will become clear, we sense.